Award recipients pose for a picture after the Leadership Recognition Program Banquet. The program honors students, advisers and organizations that have inspired and influenced Truman's campus. The Center for Student Involvement hosted the annual Leadership Recognition Program Banquet April 18. 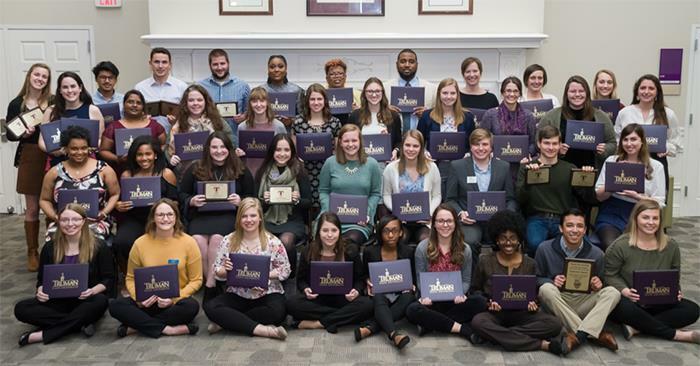 The Leadership Recognition Program honors students, advisers and organizations that have inspired and influenced Truman’s campus. 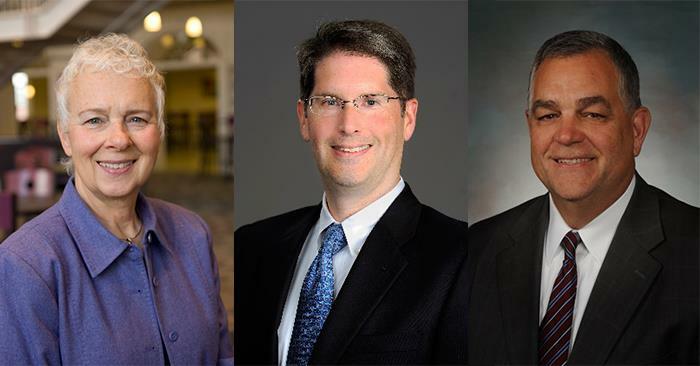 From left to right, Cheryl J. Cozette, Mike McClaskey and K. Brooks Miller Jr.
Three members were appointed to the Truman State University Board of Governors in May. Cheryl J. Cozette of Columbia, Mo., was reappointed to the Board for a term ending Jan. 1, 2024. Cozette serves as the 2018 chair of the Board of Governors. She is an adjunct professor in educational leadership and policy analysis at the University of Missouri-Columbia and a special consultant to the eMINTS National Center for programs related to school administrators. She recently retired as the assistant superintendent for curriculum and instruction for the Columbia Public Schools. Cozette graduated with a Bachelor of Arts degree in history from Kansas City College and Bible School. She received a Master of Arts degree in elementary education from the University of Missouri-Kansas City and did further coursework in educational administration at Truman. She received her Doctor of Education in educational administration (curriculum and instruction, general administration) from the University of Missouri-Columbia. Mike McClaskey of Castle Pines, Colo., is a retired Fortune 500 corporate executive. Most recently, he worked in executive capacities at DISH Network serving as the executive vice president and chief human resources officer as well as the senior vice president and chief information officer. 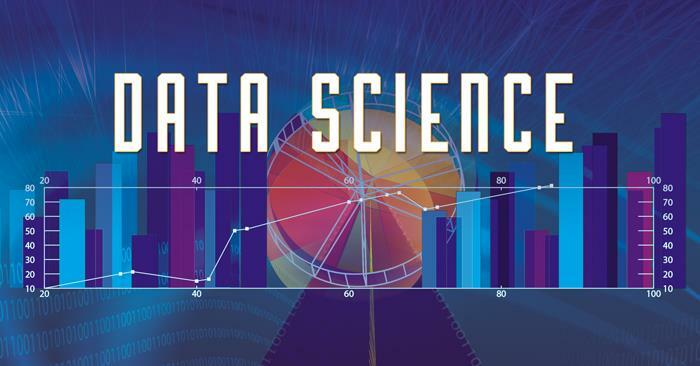 Before joining DISH, he spent 12 years at Perot Systems where he was the corporation’s vice president of infrastructure solutions and CIO. A native of Kirksville, McClaskey received Bachelor of Arts and Bachelor of Science in Education degrees from Truman as well as a Master of Arts degree from the University of Missouri. McClaskey serves as the president of the Foundation Board, and he was an active steering committee member for both the “Pursue the Future” and “Bright Minds, Bright Futures” campaigns. He and his wife, Janet (Yearns) McClaskey (’84), were named Truman’s Alumni of the Year in 2014. McClaskey was appointed to replace Michael A. Zito for a term ending Jan. 1, 2022. K. Brooks Miller Jr. of Springfield, Mo., is the president and chief executive officer of Jordan Valley Community Health Center. 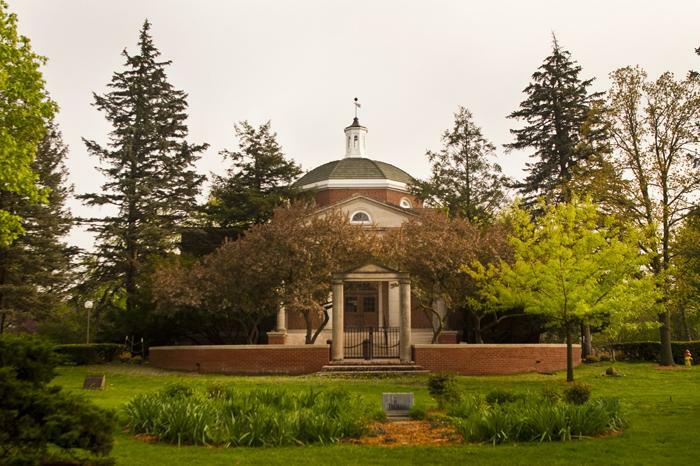 An alumnus of Truman, Miller received a Bachelor of Science degree in business administration in 1982 and a Master of Arts in Education degree in education administration in 1987. Miller’s career in health care began with the Kirksville College of Osteopathic Medicine’s Rural Health Clinic program in 1984. He advanced to the position of CEO for the Northeast Missouri Health Council, a Federally Qualified Health Center (FQHC) providing comprehensive services throughout Missouri. In 2002, he relocated to Springfield to serve as the president and CEO of Jordan Valley Community Health Center, an FQHC which offers accessible and integrated primary, oral, optometric and behavioral health care services to more than 50,000 patients annually. Miller was appointed to replace Susan Plassmeyer for a term ending Jan. 1, 2024. 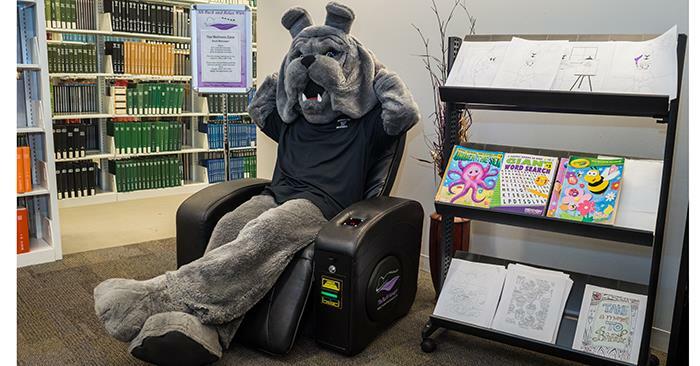 Starting May 14, Picker Memorial Library will begin a critical construction project to replace the fire suppression system throughout the building. Work will end by 5:30 p.m. Monday-Thursday and 3:30 p.m. Friday. As the construction progresses, watch for signage in the building or check the project website for the most current information about the schedule and temporary relocations of services. During times that collections are restricted, the library encourages the use of e-resources, MOBIUS and interlibrary loan. The library staff is working to balance the protection of materials with patron needs, however, visitors should be prepared for delays in obtaining materials in affected areas. Questions or concerns about the project can be directed to the library service desk at 660.785.4051 or 660.785.4533. 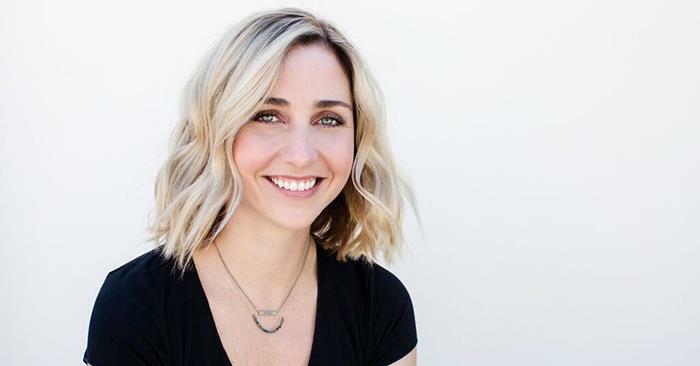 Jordan McGaughey (’07, ’08) will be the featured speaker during the Master of Arts in Education Hooding Ceremony at 7 p.m. May 11 in Ophelia Parrish Performance Hall. McGaughey earned a Bachelor of Science degree in history and his MAE in secondary social studies education. Following graduation, he accepted a position in the Fox C-6 School District as a social studies teacher at Seckman High School where he has taught for the past 10 years. In 2015-16, McGaughey was named Missouri Regional Teacher of the Year for the St. Louis area, Fox C-6 District Teacher of the Year and Seckman High School Teacher of the Year. At a surprise assembly in October 2017, he was named the only Missouri winner of the 2017-18 Milken Educator Awards. This award is given each year to outstanding K-12 teachers, principals and specialists who are furthering excellence in education. Recipients join the Milken Educator Network, a group of distinguished educators fostering effective educational leadership. Harry Truman takes a photo on the steps of Kirk Memorial with University graduates in August 1943. Photo courtesy of Pickler Memorial Library’s Special Collections Department. 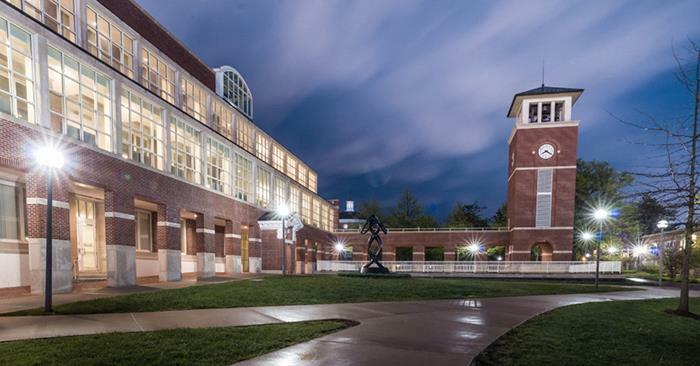 In 1996, the name Truman State University became official. 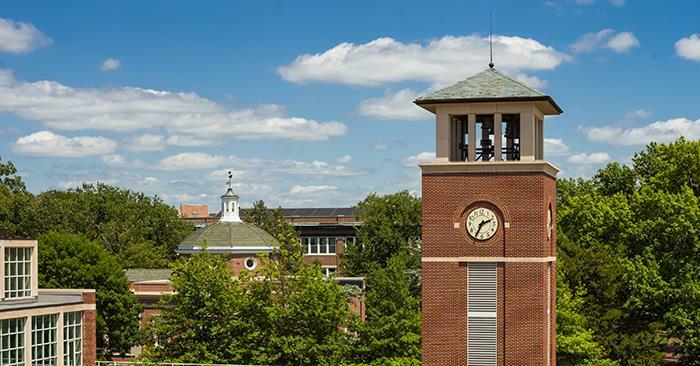 It was one of the final steps in transforming the school from a regional institution to Missouri’s only statewide public liberal arts and sciences university. The name was selected as an homage to the only Missourian to serve as president of the United States. One of the few ties Harry Truman had to Kirksville came Aug. 13, 1943. 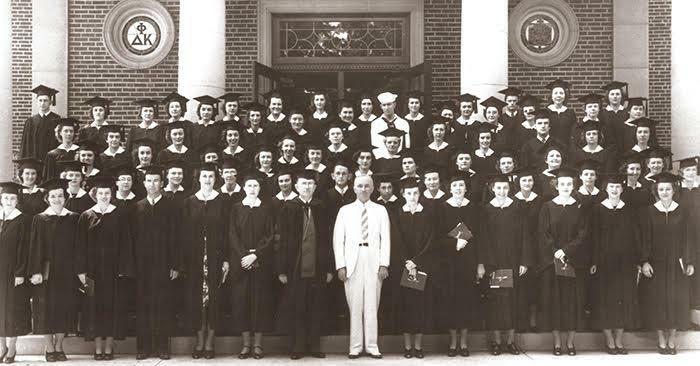 Truman, then a senator, addressed the graduating class and had his picture taken with them on the steps of Kirk Memorial. Less than two years later he would be the president, leading the nation through the end of World War II. Although Harry Truman was not an alumnus of the University – and is famously the last president without a college degree – he was a proponent of lifelong learning and public service. By all accounts, he would have embraced the spirit of the University’s vision statement to develop citizen-leaders committed to service, and the school’s association with him has come to be widely accepted as an appropriate tribute. 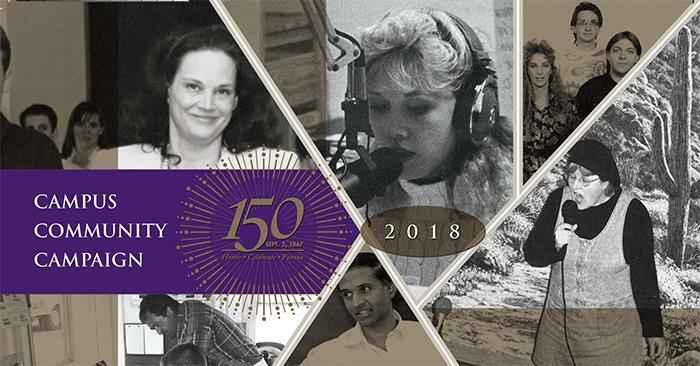 The Celebrating 150 stories included in the Truman Today during the past academic year were made possible thanks in large part to: the Pickler Memorial Library Special Collections Department; David Nichols, professor emeritus of music and author of “Founding the Future: A History of Truman State University”; the Office of Publications; Tim Barcus, University photographer; the Truman Sports Information Department; and the Index. More University history is available at truman.edu/about/history. The Campus Community Campaign allows employees to invest in an area of campus that is meaningful to them. Gifts make an impact at any size by increasing the employee giving percentage. To donate, employees can mail or bring their donation to McClain Hall 205, give online or sign up for payroll deduction. Employees who participate in the campaign by June 1 are entered for giveaways, including a reserved parking spot for a year. This year’s Campus Community Campaign participants have the opportunity to win two tickets to the Cardinals vs. Royals game in St. Louis, May 22. All employee donors are automatically entered to win. 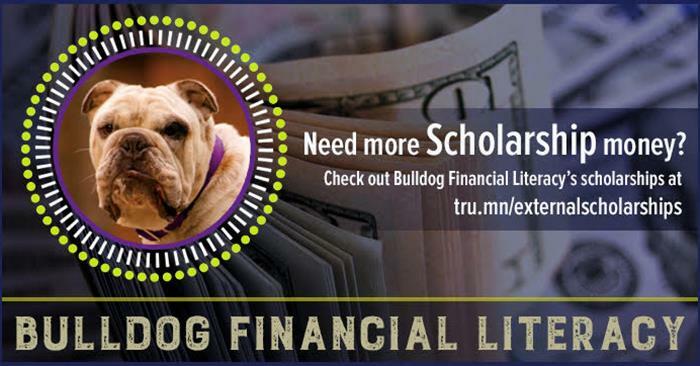 Truman faculty and staff members are not required to make a contribution to become eligible for the drawing. To enter, stop by McClain 205 to fill out a prize entry form. In order to be eligible to win. The deadline to be eligible for the tickets is 4 p.m. May 14. 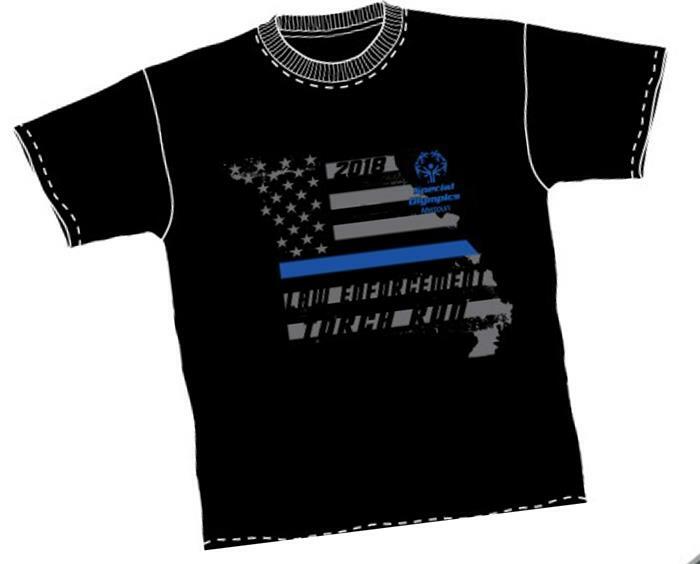 The Department of Public Safety will sell t-shirts from 8 a.m.-5 p.m. Monday-Friday to raise money for the Special Olympics. The sale is a part of the Law Enforcement Torch Run, and all proceeds will benefit the Special Olympics Missouri’s year-round sports training and athletic competition program for more than 15,000 athletes across the state. The shirts cost $15 for sizes youth medium-XXL, and shirts size 3XL-6XL cost $20. 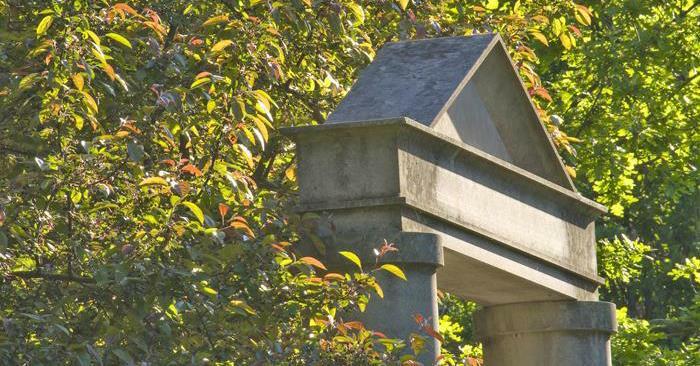 A campus tree walk will take place at 4:30 p.m. May 10. The walk will begin at the north entrance to the Quad on Normal Street. Members of the PLANTS! 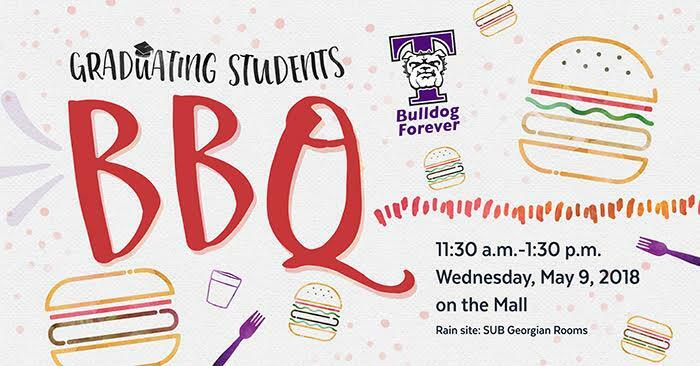 club and Lisa Hooper, associate professor of biology, will participate in the walk. For a map of the route, click here. The University Counseling Services will provide RESPOND training for faculty and staff from 12:30 p.m.-4:30 p.m. May 16 and May 17. This free, eight-hour training will teach participants how to offer effective support to a student or colleague. The course provides a basic overview of symptoms often associated with mental health concerns and offers an action plan to help RESPOND effectively. The training also includes information on how to intervene when someone is experiencing a suicide crisis. 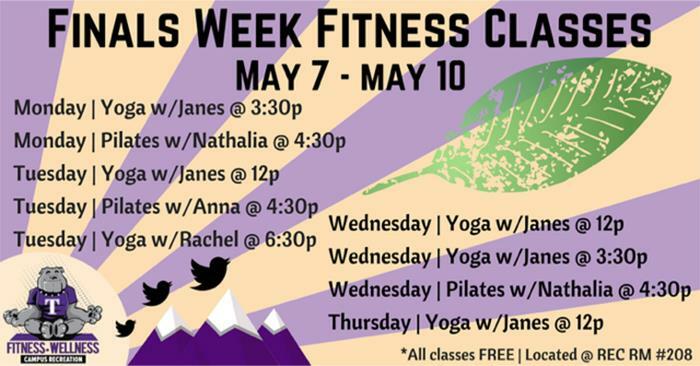 To sign up, click here. For more information, contact Joe Hamilton at hamilton@truman.edu. The central steam plant will be shut down for maintenance from 7 a.m. May 21 through 12 p.m. May 24. This will affect heating and hot water in buildings that use steam. 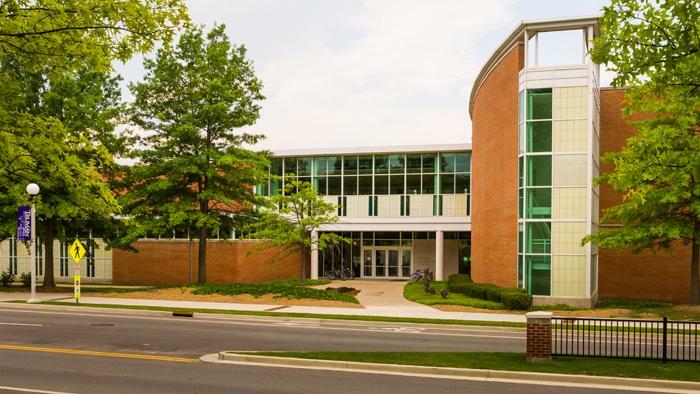 Barnett Hall, Campbell Apartments, Centennial Hall, the Ruth W. Towne Museum and Visitors Center, Ryle Hall, the Student Recreation Center and West Campus Suites are equipped with their own broilers and will not be affected. The council represents the interests of University staff and works to improve the University community. Staff who are interested in serving on the council should send an expression of interest by email, campus mail or dropping off a note at the Human Resources Office. 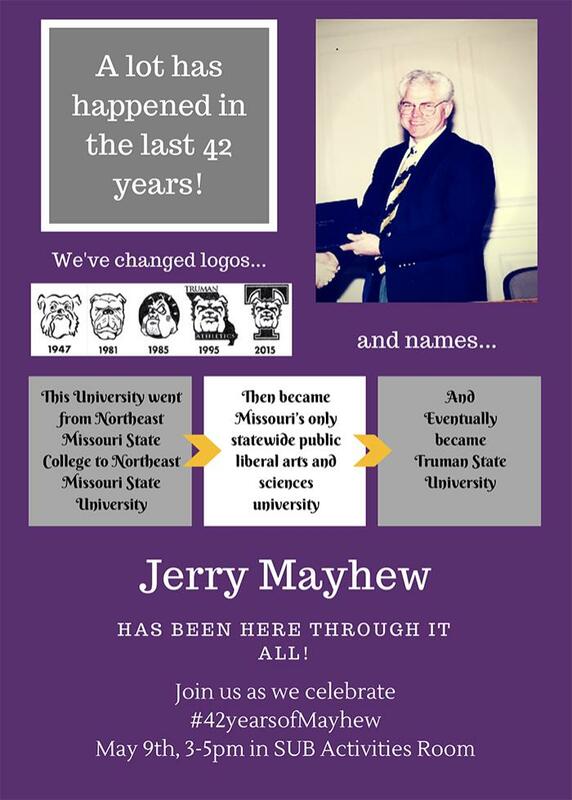 Questions can be directed to current chair Ryan Miller, ryanm@truman.edu. 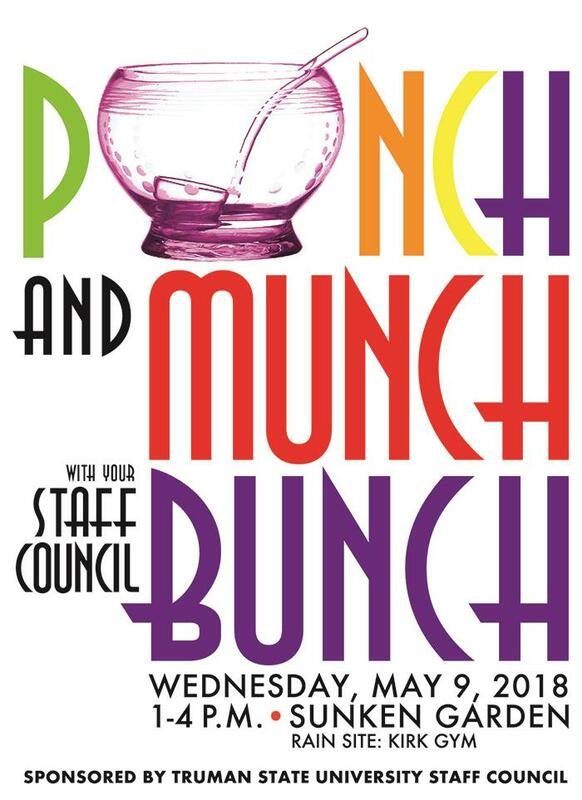 The Staff Council website can be found here. Meetings are currently once a month starting at 12:15 p.m. in Violette Hall 2451. There will be open positions in every area of the University. Truman, in partnership with Glasgow Caledonian University (GCU), offers a unique opportunity for students to study abroad in Scotland. Glasgow Caledonian University is one of the largest universities in Scotland with a self-contained campus situated right in the heart of the lively city of Glasgow. GCU has a well-established reputation for providing high-quality teaching, learning and research. While in Scotland, students can complete 12 hours of credit at one of the university’s three academic schools — School of Health and Life Sciences, Glasgow School for Business and Society, and School of Engineering and Built Environment. 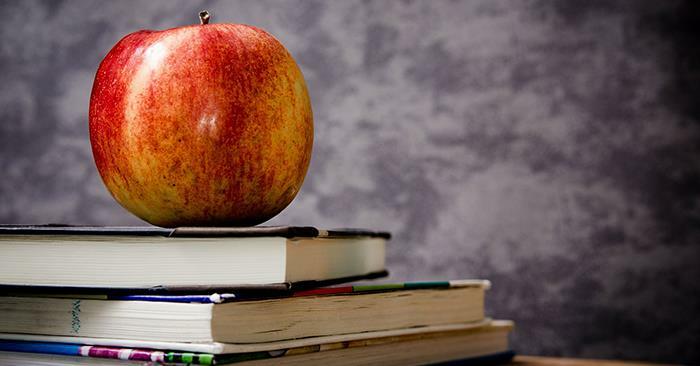 Students can take courses in a variety of subjects, including business, tourism, history, media and journalism, psychology, nursing, events and sports management, and law. All classes are taught in English. 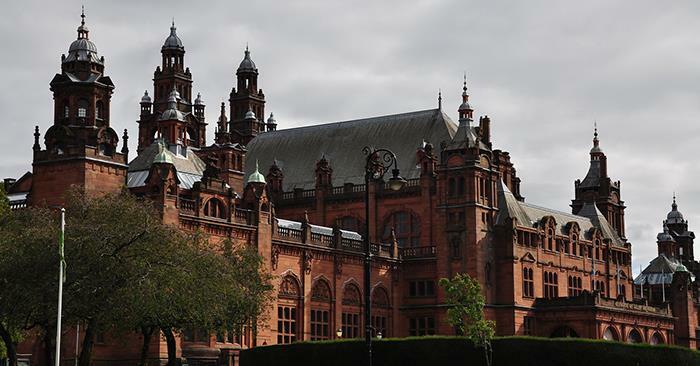 Students are responsible for arranging and paying Glasgow Caledonian University for all housing costs. GCU provides rooms on campus in the city center at Caledonian Court, with excellent shopping facilities and social amenities nearby. For more information on accommodations, visit gcu.ac.uk/study/internationalstudents/accommodation. For more information on Glasgow Caledonian, visit gcu.ac.uk. Staff Council is sponsoring a blood drive from 11 a.m.-4 p.m. June 6 in the Student Union Building. To schedule an appointment, call 1.800.733.2767, or visit redcrossblood.org and enter in the sponsor code TrumanState. The next issue of the Truman Today will be available May 29. Christa Reisinger became the softball program’s first two-time Great Lakes Valley Conference Player of the Year and second two-time conference Player of the Year. Reisinger was one of five Bulldogs to receive postseason awards as announced by the GLVC. Designated player Morgan McMahan picked up a second-team nod while right-hander Lauren Dale and third baseman Alyssa Rivera garnered third-team spots. This season’s James R. Spalding Sportsmanship nominee was outfielder Adrienne Compton.